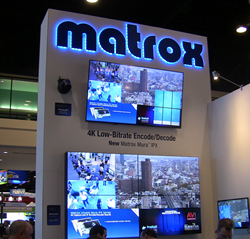 At InfoComm 2016 (Las Vegas, June 8–10, booth N2047), Matrox® Graphics Inc. will showcase the unique power and flexibility of multi-channel Full HD, 4K and 8K real-time encoding for digital signage, control rooms and other AV-over-IP applications. Matrox will also be running a Matrox Maevex 5100 encoder/decoder bundle giveaway contest at the show. InfoComm attendees can register for the promotion at the reception desk.